You may be most familiar with Yorkshire puddings when served alongside roast beef, one of Britain's most traditional food pairings. The cold batter made of eggs, flour, and milk is poured into muffin (or Yorkshire pudding) tins that are filled with a hot fat, usually from the cooked beef. Although they seem somewhat intimidating, Yorkshire puddings are actually not that difficult to make. But, if you are nervous about making them, or you have tried before and failed, then follow these step-by-step instructions—a foolproof recipe for making Yorkshire puddings. 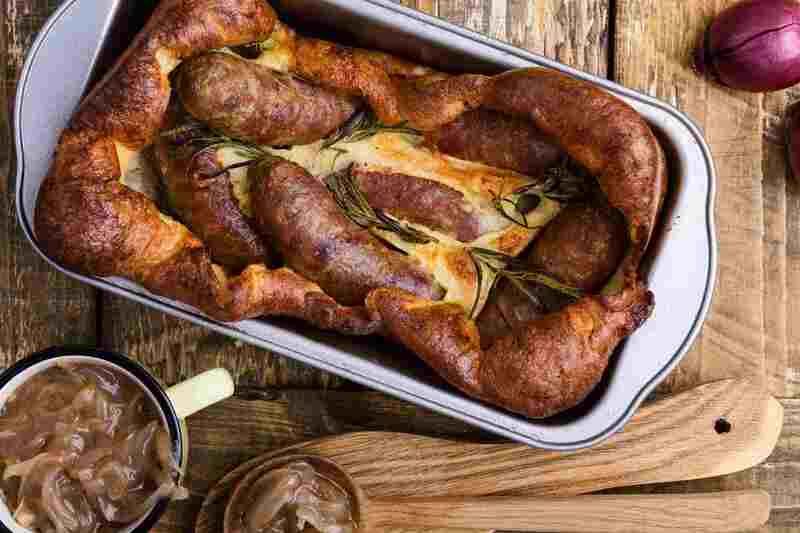 Toad in the hole is by far the favorite way to serve Yorkshire pudding for the family. Just where the name came from no one knows. Originally the dish used sausage meat, so the finished dish probably resembled toads sitting in the batter (the hole). No matter the name's origins, this recipe transforms Yorkshire pudding into a filling meal with the simple addition of sausages. This recipe makes one large Yorkshire pudding, but you can also make traditional individual ones and cut up the sausage to fit. Yorkshire pudding makes a great midweek supper when used as a ​bowl and filled with a spicy chili (either meat or vegetarian). The two work together so well—you will be surprised! And it is perfect for the whole family. However, the Yorkshire puddings do not have to have meat in them, a vegetarian version of chili will work just as well. The pudding can be made in a pie tin for "dinner-plate-sized" Yorkshires or the muffin tin sized. "Filled" Yorkshire puddings are very popular in British food, especially in the British pub. The pudding becomes a vessel to hold any number of great fillings, creating a complete meal-in-one. Any stew, such as Irish stew—as well as vegetables and gravy—can be spooned into the pudding. For filled Yorkshire puddings it is best to make dinner-plate sized puddings, as the small ones made in a muffin tin won't hold enough filling.